19 year old musical prodigy Stephon Foster is back from a two year hiatus with this “comeback” single, Boy, I Quit. It’s a smooth and heartfelt R&B jam with a quick enough pace and crisp enough beat that you can still dance to it. Passionate emotions are cloaked within the songs laid back ambiance, as deep seated feelings brim just below the surface. Like the cover art and title suggests, this single is essentially a love / break up / last chance letter to someone, but really it can be a metaphor for almost any situation where you might me ready to give up on something or someone, even yourself. The assertive, life affirming message is delivered in a very lovely and non-aggressive musical tone. The song is very bright actually and doesn’t come off as depressing at all. Stephon has a pretty voice that’s easy on the ears. I’ve often said that R&B / pop is one of the most difficult genres to sing (except maybe opera) because of all the fluctuations and dynamicism required within individual words. The artist manages to pull it off here. 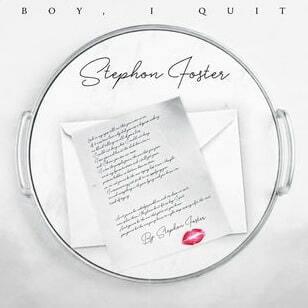 Evoking feelings of empathy and understanding, Boy, I Quit is a respectable second act for Foster and lest we not forget…Stephon is only 19 years old. There will be plenty more in store for the future.